My read-the-paper-while-eating-breakfast routine has faltered recently while I’ve been busy getting this blog off the ground, but I’ve now been backtracking through articles I had earmarked for closer attention. One such was Nicolle Flint’s “Handbag Hit Squad…” in which she argues against women’s literary awards, for example, because she believes they undermine the concept of “merit-based success”. Indeed, the arguments for such awards are hypocritical, she says, in the same way that allegations of sexism against Tony Abbott are hypocritical (click here to see the full article). That stumped me because it suggests that women who ‘fail’ do so because of personal deficits and could surely do better if they so chose. However, it is certainly true that if women of my cohort had pitched for work, promoted themselves (heaven forbid), and resisted domestic responsibility they would have been treated with grave suspicion, or even as seriously deranged. Clearly, the image of ideal womanhood changes over time and place and is always more or less imperfectly embraced, or subverted, by particular women, but it is also always part of the context when we are trying to understand women’s achievements, or apparent lack thereof. After all, what is deemed an achievement is itself potentially gendered (winning a literary award, for example, versus writing a story with your four-year-old). So, whether or not we need to invoke explicit industry sexism to understand the statistics on establishment prizes, we do need to understand the social construction of gender (as well as race, class, sexuality and other dimensions of privilege). The concept of merit-based success only makes sense on a level playing field, and the terrain still looks pretty bumpy to me. There needs to be lots of levelling with whatever tools are available before circling back to Flint’s concerns about merit. In the meantime, affirmative action programs can be part of the way forward. After all, Obama may have attended college on an affirmative action scholarship, and his subsequent achievements are certainly noteworthy. Please, the universe, may his success continue through the current election. 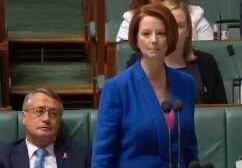 And, in closing, I definitely think Julia Gillard’s misogyny speech deserves an award: it has lots of merit, and much success at affirming many of its millions of viewers (click here to link to the YouTube clip).